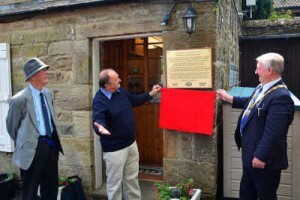 On 9th June, a plaque at the entrance to the Canal Centre Tearoom was unveiled by Provost Tom Kerr and Professor Professor Paul Jowitt, past President of the Institution of Civil Engineers (ICE). The plaque acknowledges the designation of the Union Canal as a National Historic Civil Engineering Landmark by the ICE Panel for Historic Engineering Works in Scotland (PHEW Scotland). Afterwards Professor Roland Paxton of PHEW Scotland presented LUCS with a rare original edition (April 1815) of Thomas Telford’s first report on the Union Canal. This important document is likely to go on display in the Canal Museum.